I could have titled this post “Blog-iversary, Sew-iversary, or just plain Anniversary. But Fun-iversary seems more fitting, as FUN is what this past year of fashion sewing and blogging has been. It was one year ago this week that I started my blog. 1) Discovering all the passion for fashion and home sewing all over the world. I feel like I am part of a great sisterhood (brothers welcome, too!) where creativity, industriousness, and appreciation for the tactile process of sewing are a very large part of defining who we are. The global aspect of it is quite remarkable. 2) I have become a much better dressmaker because of all I have learned from my fellow bloggers and from non-blogging readers who comment on my posts. 3) Blogging has helped to define my personal appreciation for knowing how to sew – I always knew I loved it, but writing about it has made me realize what a gift it is in my life. Well, I can’t let this benchmark pass without celebrating it in some small way with my readers. 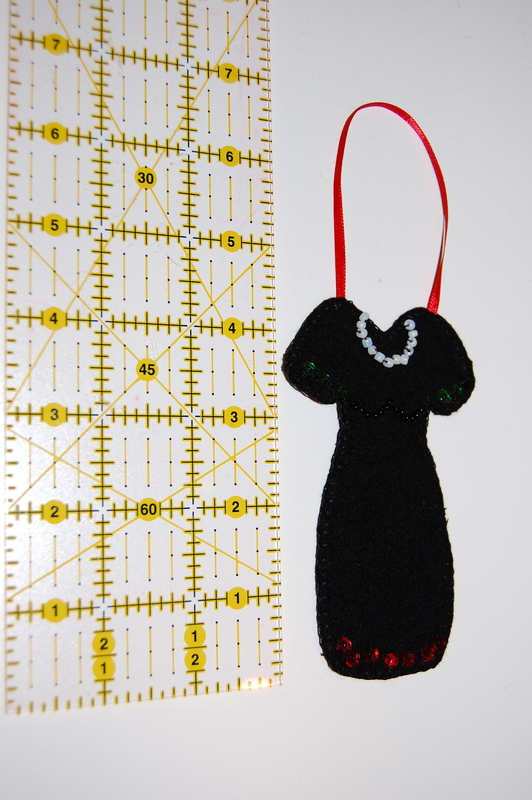 So, I made a very small Little Black Dress – as in 4½” – which could hang on a Christmas tree, adorn a present, decorate a sewing room, or attach to the hanger you use for your own LBD, to reserve its place in your closet. This is my Fun-iversary give-away. 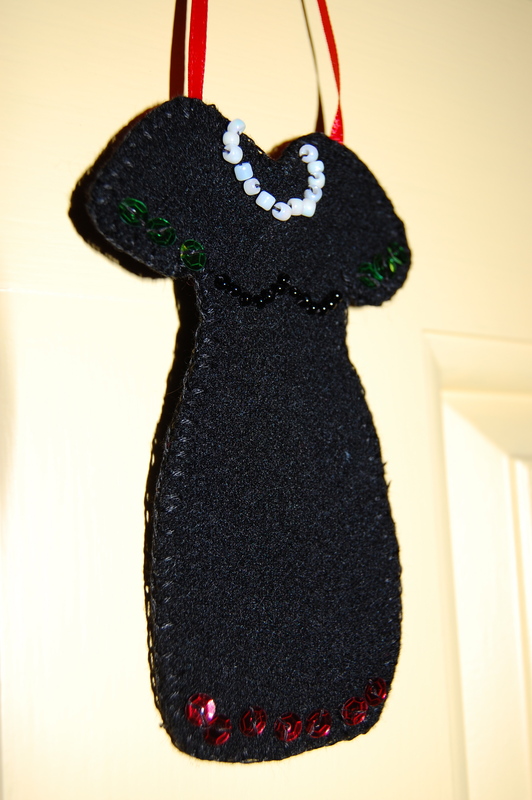 This little dress is made out of black wool, taken from a dress I made in 1973. 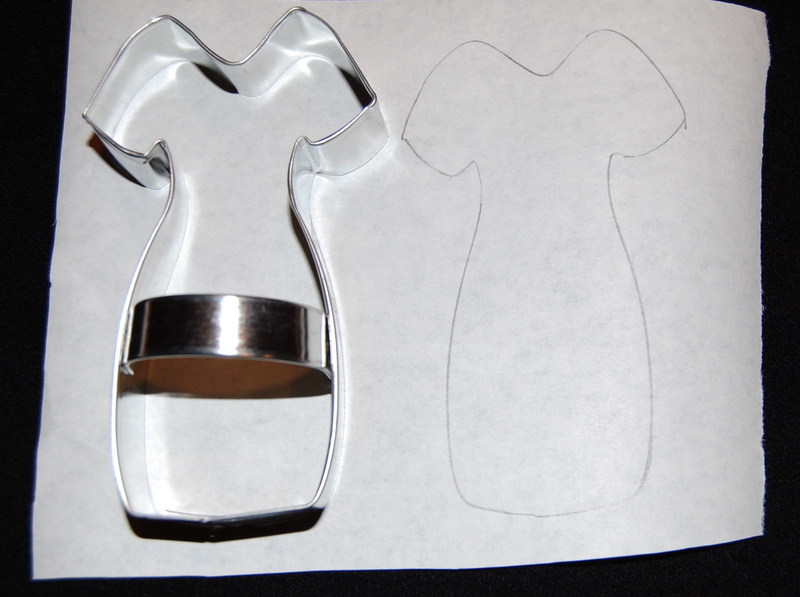 I used a LBD cookie cutter from Ann Clark as my template. 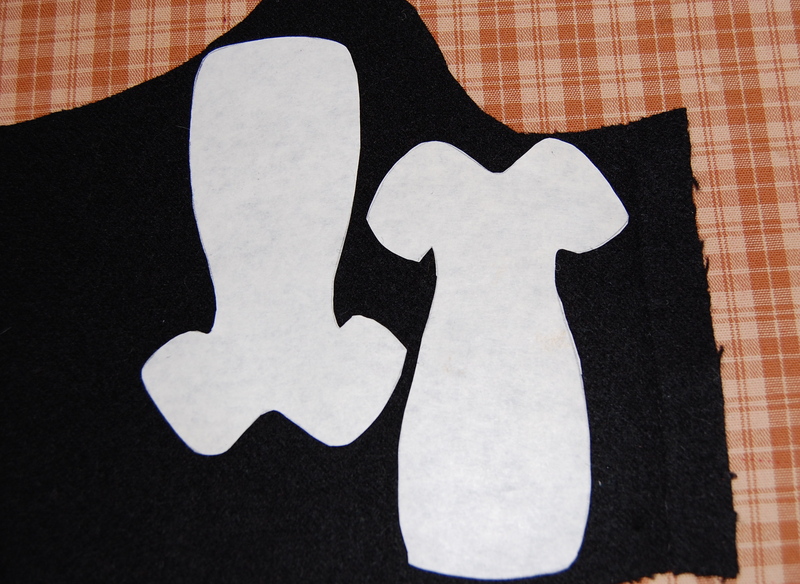 The LBD is double-layered and I joined the two sides together with a blanketstitch. First, I traced the outline onto freezer paper. 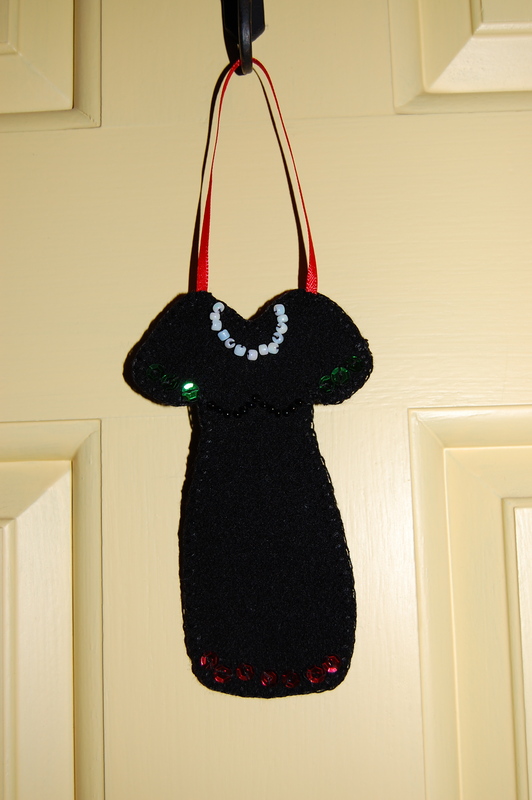 Then I ironed the glossy side of the freezer paper onto the black wool, cut out the shapes, peeled off the freezer paper and started to decorate with beads and sequins. I “defined” the bust-line with little black beads, and joined the front and back together with a blanket-stitch, done in black embroidery floss. The LDB next to a ruler. 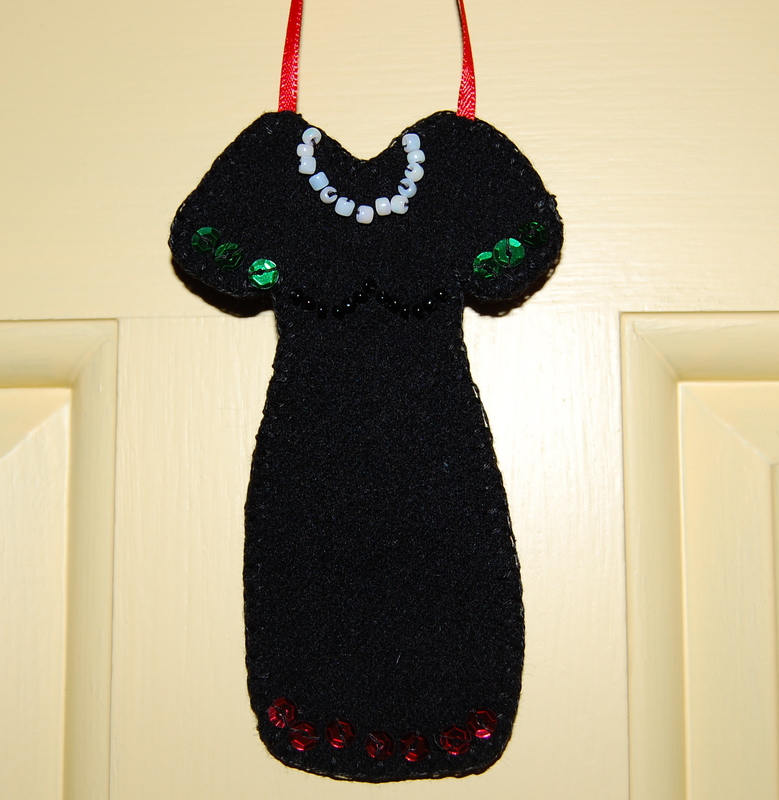 If you would like a chance to own this very small LBD, please send me a comment by your time midnight on November 15th. The winner will be drawn by random on November 16. I am also grateful to Sarah of Goodbye Valentino for giving me this lovely “Blogger award” for commenting regularly on her posts. 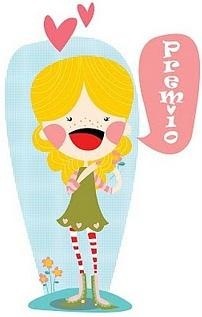 I am delighted to pass this on to Brooke of Custom Style (my number one commenter! ), Lizzie of The Vintage Traveler, and Dressesandme. In addition, thank you to Carol, Cissie, Nancy, Mary, and Barbara, whose frequent comments are always welcome and much appreciated! Thanks, Brooke! I loved your post last year about the felt ornaments you had made with specific people in mind! That LBD is just too cute for words! I want it!!! It was fun to make – and all finished in one day, which never happens with my “big-sized” garments! Happy 1st blogging anniversary, Karen! Thanks, Deb – I’m delighted you are keeping up with my blog! A happy Fun-iversary to you! It is amazing how blogging leads to friendships. I appreciate your visits to my blog so much, and a big thanks for the award. This makes my day. 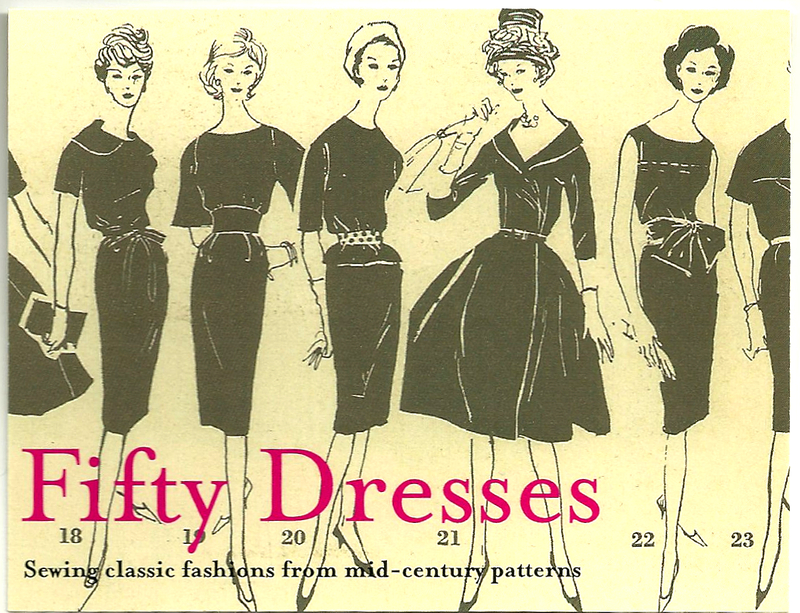 Ah – a big thank you to you for sharing all your amazing knowledge about vintage style/clothing/manufacturers, etc.! Congratulations on your one year fun-iversary and many more happy returns! Inspired by your LBD I had the bright idea to make one out of vintage black velveteen twill fabric using my own pattern and held together by buttonhole stitches. The velveteen was to be used for bound buttonholes, welts, and collar on tweed and needed to be relaundered anyway. After extensive research I finally decided on Jacqueline Enthoven’s Tailor’s Buttonhole. The thread doesn’t twist while you are working and the edge makes a nice braid. The pattern was made using a tracing paper overlay over a nine head high fashion figure in one inch divisions.The design was sleeveless and scoop necked like a swimming suit. Like magic the dress measured four and a half inches! I stitched all around with the buttonhole stitch using a single strand of sewing thread before joining the sides, then couched down vintage rose gold metallic thread around the neckline. I want to make another one now to perfect it and give as a gift, but it is just as I envisioned it and I really have to thank you. The LBD was a small object where I could test out sewing techniques and had success! I always learn so much from your comments! I checked out J.E.’s Tailor’s buttonhole stitch and of course will now try it myself. Thanks for this great idea.